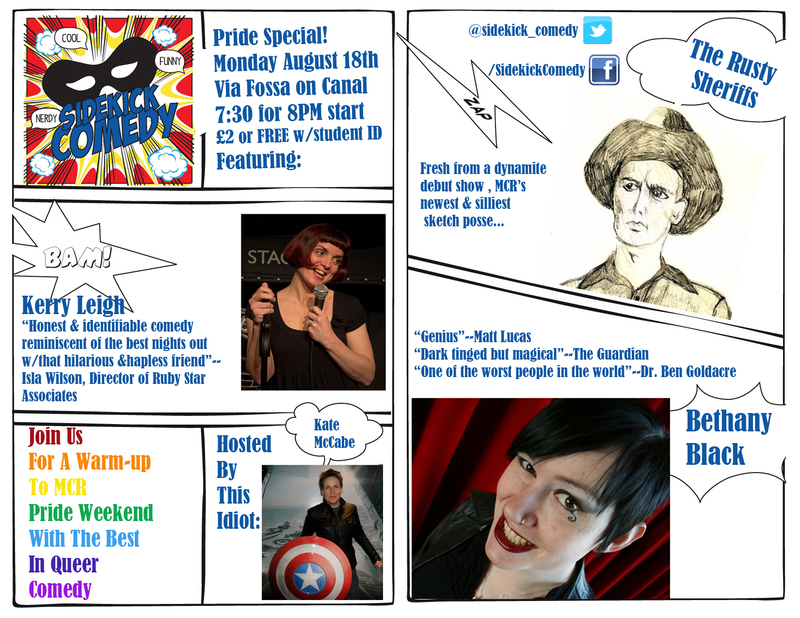 Monday August 18th is our Pride special. We’re a week early this month. To both celebrate and get out of the way of the big pride party at the venue. Though we always book the best in alternative comedy at Sidekick, this month we have the best in LGBTQ comedy. We’ve got the future star of Russell T Davies’ BANANA, Bethany Black, Star of Laughing Cows Comedy, Kerry Leigh, and the amazing newcomers on the MCR sketch scene: The Rusty Sheriffs. It’s going to be dynamite. 7:30 doors, 8PM start, 10PM finish. £2 or FREE with student ID card. This entry was tagged Alternative, Bethany Black, Canal Street, Comedy, Kerry Leigh, Manchester, MCR, Sketch, Stand-up, The Gay Village, The Rusty Sheriffs, Via Fossa. Bookmark the permalink.